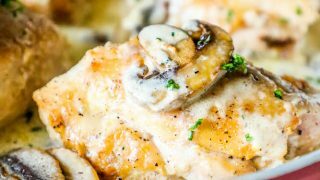 Creamy Garlic Chicken Thighs and Mushrooms Recipe – a hearty, creamy, keto creamy chicken and mushrooms dinner in just one pot! 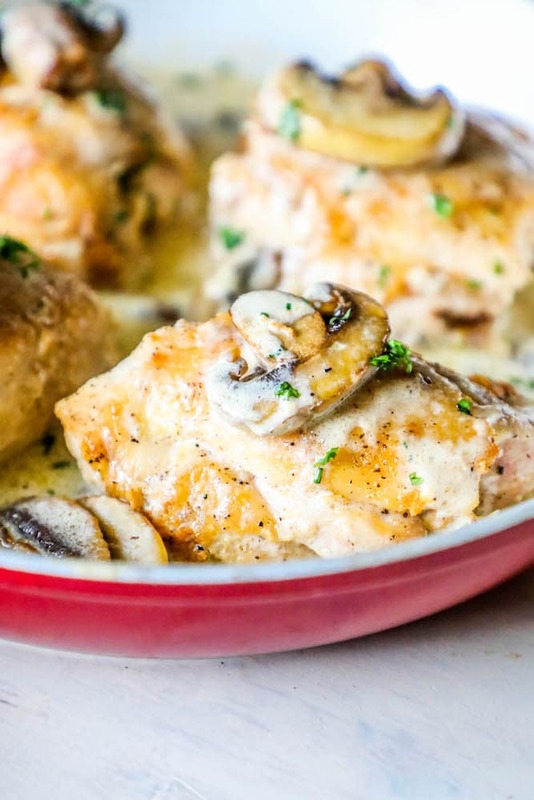 Your whole family will love this one pot creamy garlic chicken and mushrooms recipe. 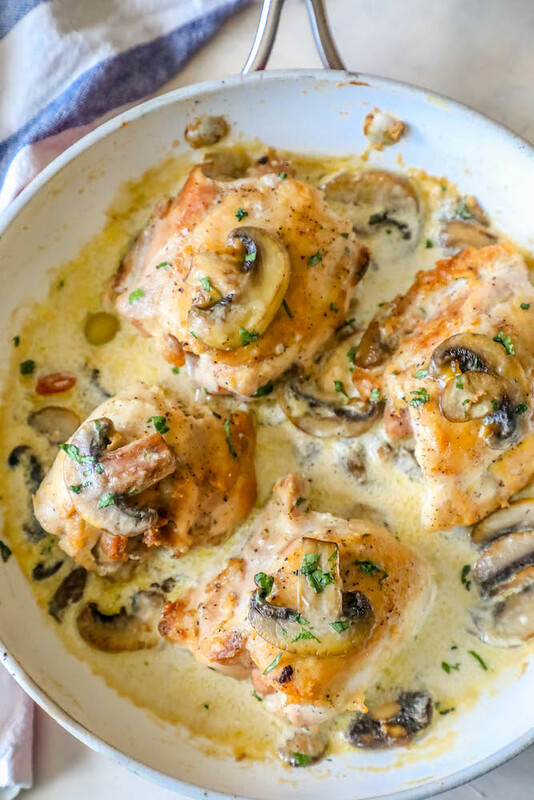 This one pot creamy garlic chicken thighs and mushrooms recipe is simple, quick, naturally low carb – and a huge family favorite! 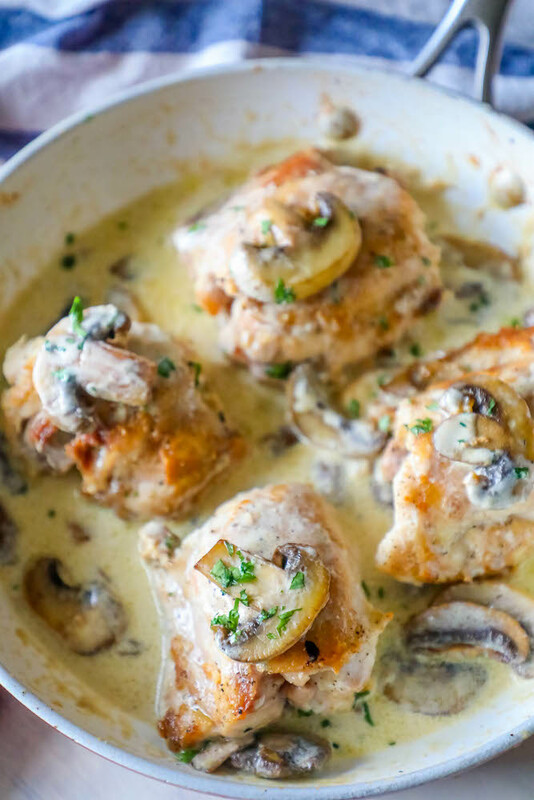 If you love rich and delicious garlic cream sauce flavor, with perfect crispy chicken thighs and delicious sautéed mushrooms – this one pot chicken recipe is great for you! 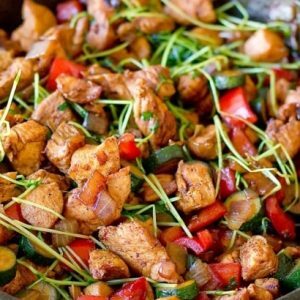 If you’re following a keto diet, this one pot keto chicken dinner will become a fast favorite – it’s even great for family members who are eating carbs, spooned over rice or pasta. 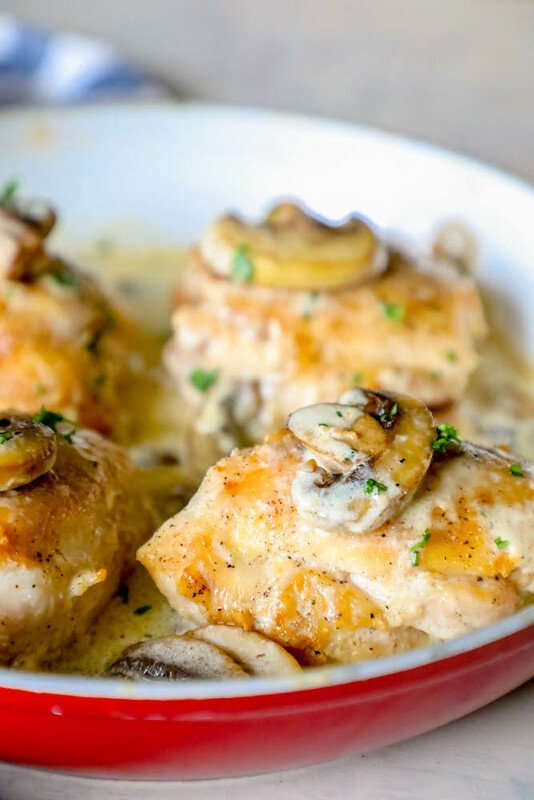 This creamy garlic chicken thighs and mushrooms recipe is a simple one pot dish you’ll be adding into your weekly menu rotation in no time! 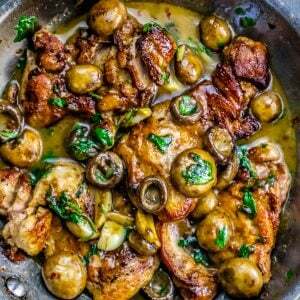 Just take me to the Easy Creamy Garlic Chicken Thighs and Mushrooms Recipe already! If you’d like to get straight to the recipe and skip my helpful tips and tricks for how to get crispy chicken thighs, how to prevent cream sauce from breaking – please scroll to the printable creamy garlic chicken thighs and mushrooms recipe at the bottom of the post (just before comments!). To get the most delicious chicken thighs, it helps to give them a crispy crunch so they keep a great texture. 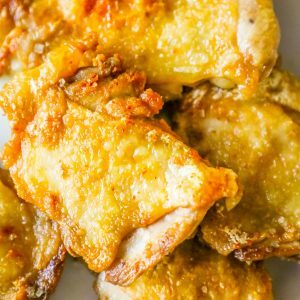 It can be difficult to get the perfect crunchy chicken thighs, it is best to let them crisp before making your creamy garlic sauce – cooking them almost all the way to temperature so that they can go back into the sauce to finish up, without getting soggy. There are a few tips to get perfect crunchy chicken thighs in a cream sauce – these will help you cook perfect chicken thighs every time! Adding too much chicken to the pan will reduce the surface temperature and will prevent the chicken thighs from crisping properly. Space out chicken in pan so it is not overcrowded. Don’t flip chicken thighs before they have a chance to crisp up, or your chicken could be soft and flabby later when adding the sauce. -Unroll thighs for more crunch. 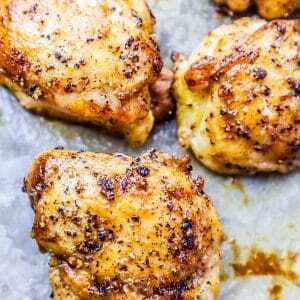 For chicken thighs to get the best crunchy skin, unroll the chicken thighs. I don’t photograph chicken with the thighs unrolled often (because they can look a bit funny) – but unrolling chicken thighs will help them crisp up and cook faster so they don’t dry out. -Let sit on paper towels while forming sauce. Let your chicken sit outside of the pan on a plate with paper towels to let them set while cooking the sauce. Chicken should be golden brown when removed from pan to make sauce, but doesn’t need to be cooked all the way to 175 internal temperature yet since it will go back in mushroom cream sauce to finish cooking. -Let finish in pan with sauce to soak up some flavor. Add chicken back to pan when sauce has come together but not reduced, so chicken can finish cooking to 175 internal temperature when inserted with a digital meat thermometer. To keep a delicious, rich, and hearty cream sauce, it helps to take a few steps so the sauce doesn’t break – or separate the cream from the oil. Whenever I add cream to a dish, I turn the heat completely off, and whisk it in to prevent the sauce from breaking before I turn the heat back on. It is always a good idea to turn heat off of your stove before adding in the heavy cream and then whisk vigorously when adding – that is the best way how to prevent cream sauce from separating! 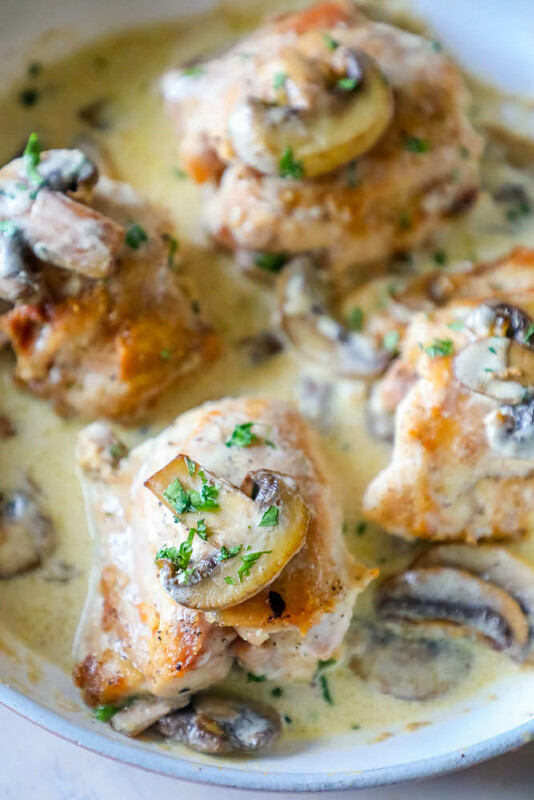 If you love this easy chicken thighs and mushrooms in a creamy garlic sauce recipe, you’ll love my other easy keto chicken dinner recipes – perfect for a low carb chicken dinner the whole family will love. 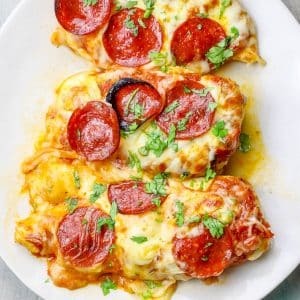 Click the link to open each easy low carb chicken dinner recipe. 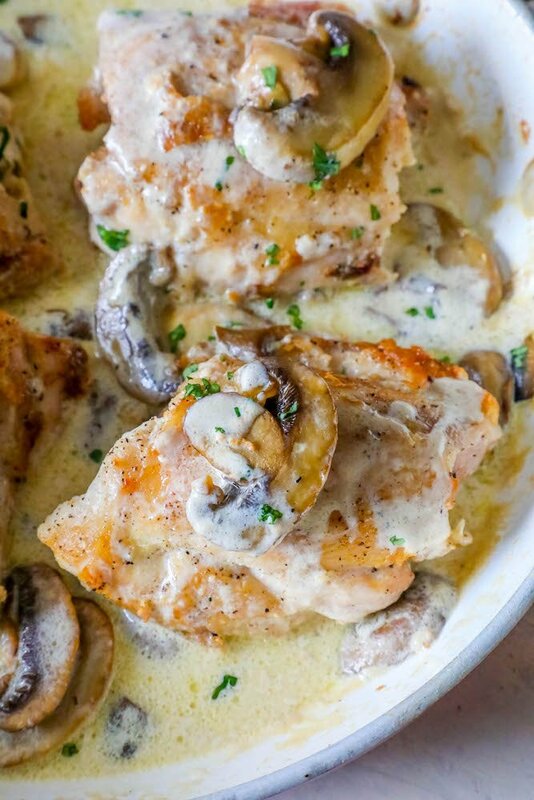 If you love this easy Creamy Garlic Chicken Thighs and Mushrooms Recipe, please give it a five star review and help me share on facebook and pinterest! Heat a heavy pan on medium high until very hot. Add 2 tbsp butter, swirl around pan, and let melt. When butter is foamy and melted, add chicken thighs. Cook chicken thighs 5 minutes on each side, until lovely golden brown. When chicken thighs are well browned, remove from pan - do not drain pan grease. Add garlic to pan, stir well. Add mushrooms to pan, stirring occasionally to keep mushrooms and garlic from burning. Add second half of butter (2 tbsp) to pan, let melt. Let garlic and mushrooms brown - about 4-6 minutes. Do not let garlic burn, reduce heat if needed. Add red pepper flakes (add slowly according to your taste) and parsley when chicken and mushrooms are lovely golden browned. Stir well, being sure to scrape up any browned bits from bottom of pan. Turn heat off. Whisk in cream until well mixed. Return heat and let cream sauce slowly boil and reduce to get creamy and thick. Add chicken thighs back to pan, let sauce reduce another 5-8 minutes, flipping chicken occasionally, until thick and chicken thighs are 165 internal temp. Remove from pan and serve immediately! This is just like a recipe my grandma made us as kids! I can’t wait to try this! This looks and sounds SO GOOD! I’ll have to try your methods! Such a great way to prepare chicken thighs! 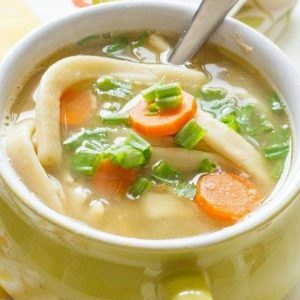 This will be added to my favorite go-to recipes! In love with this for dinner! It’s so good and so simple! It’s so creamy and juicy – everyone loved it!